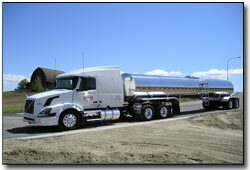 Idaho Milk Transport, Inc. is a for hire carrier of food grade liquid products throughout the U.S., Canada, and Mexico. Idaho Milk Transport, Inc. began in 1986 When Brother’s Gene and Robert Brice, started transporting milk with 2 trucks from local dairies to processing plants in Salt Lake City, Utah. From that time the company has grown to over 100 power units and 150+ trailers serving over 100 customers. Idaho Milk Transport, Inc’s corporate headquarters are located in Burley, ID and operates terminals in Yakima, WA and Fresno, CA. We are U.S. and Canadian Customs Bonded. Idaho Milk Transport, Inc. has been a leader in the transportation industry; we were the first to offer longer combination vehicles, and 53’ supertankers for farm pickup. We have stayed on the leading edge of technology in order to offer increased efficiencies to our valued customers. The goal of Idaho Milk Transport, Inc. is to offer safe, reliable, quality and efficient transportation services, which will enable our customers, both external and internal, to compete profitably in today’s global environment.